If you are already reading this article or felt a tingle of recognition or awareness upon spotting the blog title, then you already know that teaching is not a job, it’s a mission. You’ll be doing it every day for the rest of your life, so it IS your life. When you are asking yourself how you want to teach, who you want to be as a teacher, and when you are digging a little more deeply into your own needs and wishes, you are really asking yourself how you want to live your life. By choosing to teach, you are choosing to give, regardless of what you will give or who you will give it to. In fact, we could argue that you are not living if you’re not giving. As teachers we are very profound creatures indeed. The knowledge we share can be either blessed or cursed by the spirit in which we share it. Objective facts are like trees falling in the forest that no one can hear. The falling tree should have cause – effect and sound, but there is no human engagement or sense of action, so its significance and reality is lost. As teachers we must be significant and real in a subjective sense in order to engage the human spirit. We want our students to hear us – really hear us. As individuals we cannot be real if all we do is merely adopt hand-me-down principles and ill-fitting beliefs. As teachers we cannot have a significant impact on others if we cannot define, plan and map out our own visions of life and learning. 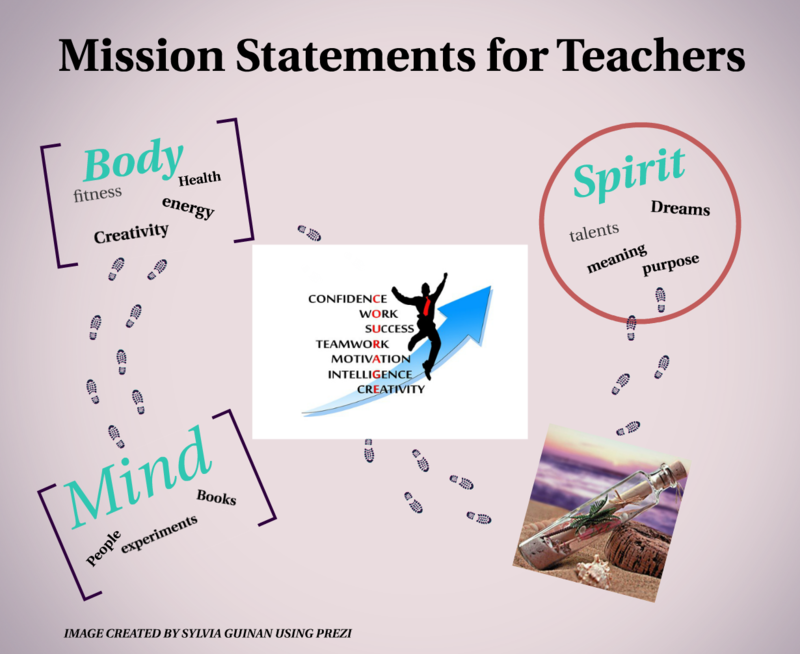 Although I believe that mission statements are important in all walks of life, I’ll be referring specifically to online teachers in this article. Things like ”reality”, ”tangibility” and ”social proof” take on an extended significance for online teachers as they are literally being ‘born again‘ in virtual worlds. I believe that we subconsciously share our mission statements on a daily basis. A chosen word, smile, a favourite quote, song, or book – all of those things define us in any given moment. These fragmented thoughts, dreams, feelings and inspiration are just ephemeral clouds, however, if we don’t capture them in a lifelong vision. While we should never stop dreaming, cloud-watching or changing our dreams, there should be a fundamental purpose, a bigger picture within which your dreams, moments, and thoughts will feel free to dare greatly. Lack of vision feeds fear. Fear thrives on insecurity. Insecurity hurts ourselves and our students. Your teaching values, talents and vision help you to know the unknowable. This is the confidence that drives away fear and inspires others to do great things. Five ways to map your mission. 1) Plan for your whole self – body, mind and spirit. How are you going to keep physically and mentally fit it ways that will support your work? How are you going to keep inspired and keep learning? What is it all going to mean in the future when you look back on your life? Mission statements are not about to-do lists or short term goals, or even long term goals. They are expressions of your lifelong purpose. When you plan for work, plan for the other parts of your life, as they will enhance your working life in the long run. Go somewhere quiet in nature, such as a beach, a forest, or a garden. Then follow these instructions. a) Sit somewhere, try not to think and listen to the sounds around you till you feel relaxed bough to listen to yourself. b) Try reaching back by remembering things you loved from your childhood or meaningful memories. c) Re-examine your motives by thinking deeply about why you do what you do and why you make certain decisions. It should become clear upon deep reflection what motivates you, and which lifelong values underpin these motivations. When your values and principles take on new meaning for you, you will make better decisions on your career and teaching life, as your mission will be clear. You are now tough enough to live out your newly defined purpose for work and life. Mindmapping helps you to build up a creative flow through making subconscious associations on paper or on a mindmapping application. The key words and images you come up with can tell you a lot about who you really are deep down and how this will play our in your professional life. Here’s an article about mindmapping if it is a new concept for you. See how the story of your heart and mind reveals itself to you. One way of doing this is to ask yourself some key questions and then start writing, scribbling or doodling without thinking about your words. When you read it back, how does it make you feel? Inspired, surprised, scared? Hopefully all of those and more. If you feel stuck or feel that you’re never going to write it, one short-cut is to gather up a kind of scrapbook of your daily mini-inspirations. Think of a song, a book, a quote, an experience, a laugh, moment. What is so special about all of these little things? What is the common denominator? Is it the people, the synergy, is it the beauty of language, ideas? What could you do with these ideas and experiences in your work and life? Try experimenting with little inspirations, integrate them into your work and blog about them. As online teachers we can’t get creative without publishing. Also our mission statements, in this case, are professional statements, so they can be showcased on our websites, resumes and social media profiles if we so wish. 1) You can blog your statement and put it on a video or other multi-media style presentation and share it with your personal learning networks. 2) You can mindmap or sketchnote, or doodle it as I said before. Combining word with imagery makes the statement all the more powerful. Here’s an article about visual design which explains this power. 3) Make an infographic of your mission statement. 4) Keep a teaching blog diary that describes your daily or weekly goals and achievements. Always make sure they are in line with your vision and make changes where necessary as you go about your teaching life. 5) Write a letter to your future self about your mission, goals and dreams. Put the letter in a bottle and bury it for 365 days or give it to a friend for safe keeping. Go back in a year and see what changes you’ve made towards becoming the teacher you want to be. Publish your successes, blog about them, write an ebook, create new courses, hold webinars, help others to do what you did. A paragraph that incorporates mind, body, and spirit principles should cover the values you need for a rich career and life. Revealing your mission statement to yourself is really a work of detection. Your purpose is within you and you need to make it part of your persona, brand, personhood and professional identity. Revealing your mission statement to the world will make you stand out, become a confident teacher and brand your work with integrity, clarity and insight. People will know where to find you and you will know where to find yourself. 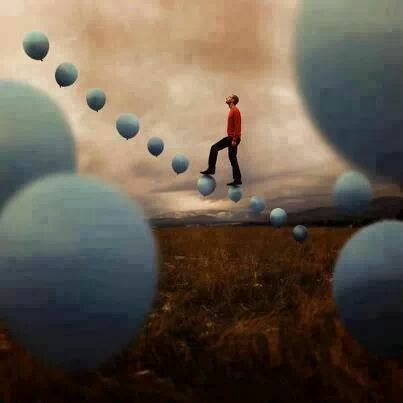 Virtual reality, social media and online networks will not drown out your true presence, they will amplify it. You will know exactly how you want to help people and they will respond to your message. 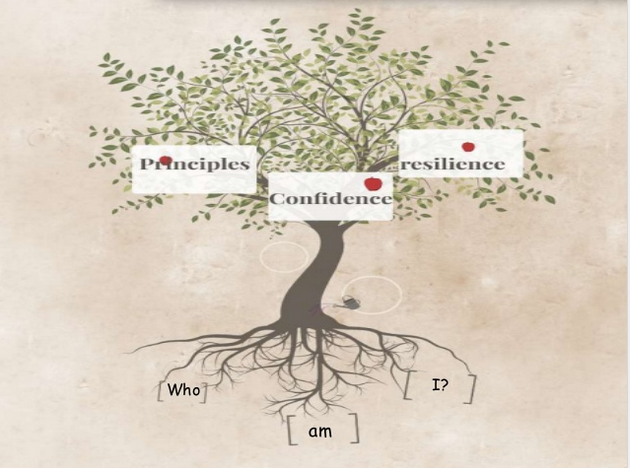 “Daring Greatly” inspired & coined by Browne B; 2013, Daring Greatly: How the courage to be vulnerable transforms he way we live, love, parent and lead, Portfolio Press. Sylvia Guinan is an online English teacher, writer and blogger who facilitates professional development online.She uses brain-friendly techniques to help students and teachers around the world She blogs and runs courses on the WiziQ platform and runs her own website. She is also Joint Web Editor for the IATEFL Learning Technologies Special Interest Group. « How Well Do You Know German Culture? Test Your Knowledge With This Quiz!